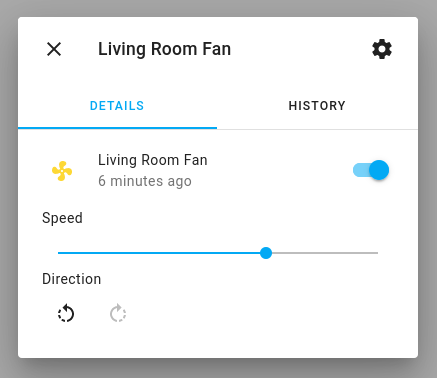 With the fan domain you can create components that appear as fans in the Home Assistant frontend. A fan can be switched ON or OFF, optionally has a speed setting (LOW, MEDIUM, HIGH) and can have an oscillate output. This component restores its state on reboot/reset. name (Required, string): The name of the fan. oscillation_state_topic (Optional, string): The topic to publish fan oscillation state changes to. oscillation_command_topic (Optional, string): The topic to receive oscillation commands on. speed_state_topic (Optional, string): The topic to publish fan speed state changes to. speed_command_topic (Optional, string): The topic to receive speed commands on. All other options from MQTT Component. Toggles the ON/OFF state of the fan with the given ID when executed. Turns the fan with the given ID off when executed. id (Required, ID): The ID of the fan. oscillating (Optional, boolean, templatable): Set the oscillation state of the fan. Defaults to not affecting oscillation. speed (Optional, string, templatable): Set the speed setting of the fan. One of OFF, LOW, MEDIUM, HIGH. If you template this value, return fan::FAN_SPEED_..., for example fan::FAN_SPEED_HIGH.